The team was popular throughout the 1940s, but superheroes' cultural prominence faded, and the JSA's adventures ceased with issue #57 of the title (Feb-Mar 1951). JSA members remained absent from comics until ten years later, when the original (Jay Garrick) Flash appeared alongside a new character by that name in The Flash #123 (September 1961). During the Silver Age of Comic Books, DC Comics reinvented several Justice Society members and banded many of them together in the Justice League of America. 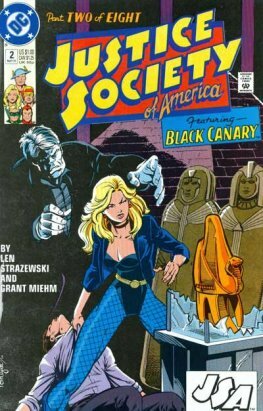 The Justice Society was established as existing on "Earth-Two" and the Justice League on "Earth-One". This allowed for annual cross-dimensional team-ups of the teams, lasting from 1963 until 1985. New series, such as All-Star Squadron, Infinity, Inc. and a new All-Star Comics featured the JSA, their children and their heirs. These series explored the issues of aging, generational differences and contrasts between the Golden Age and subsequent eras. 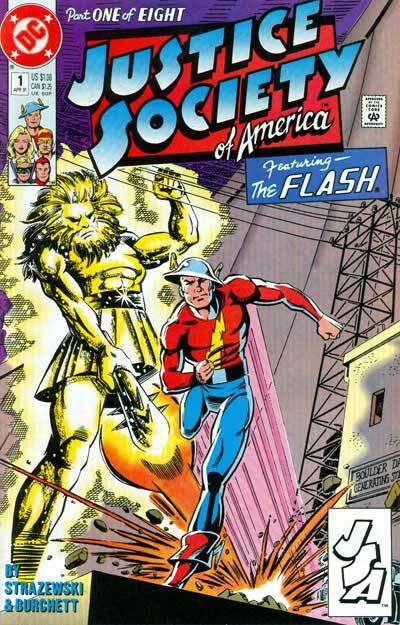 The 1985 Crisis on Infinite Earths limited series merged all of the company's various alternate realities into one, placing the JSA as World War II-era predecessors to the company's modern characters. A JSA series was published from 1999 to 2006. A new Justice Society of America series ran from 2007 to 2011. As part of DC Comics' The New 52, the team appears in the Earth 2 ongoing series launched in 2012.